The Blendtec Designer Series does a very good job of looking small and sleek. 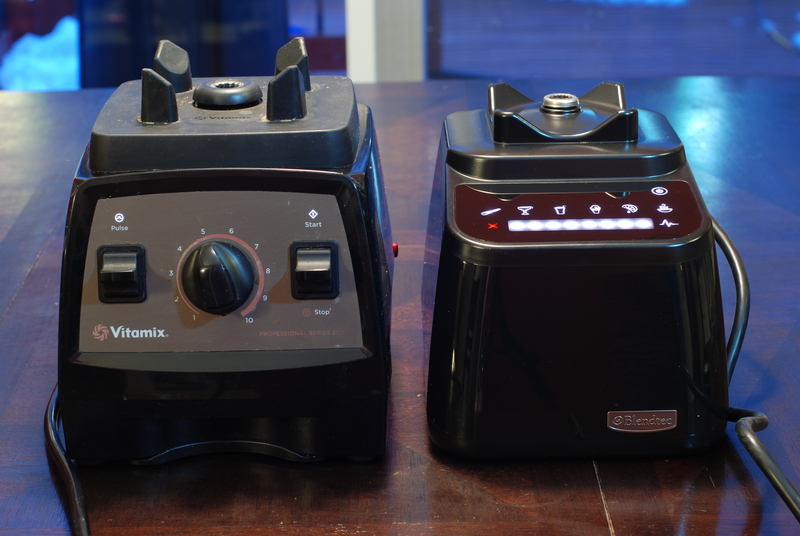 It is smaller than the Vitamix Pro 300, but looks smaller than it actually is. I do like the Blendtec touch panel, but I’m also a huge fan of the simplicity of the Vitamix design and ease of use. Another thing I really like about the Vitamix is the physical power switch that kills the LED light, minimizes electricity usage when not in use and ensures the Blender won’t be accidently turned on. The Blendtec power button glows fairly brightly as long as it’s plugged in. The front of the Vitamix Professional Series 300 and Blendtec Designer Series, both powered off. 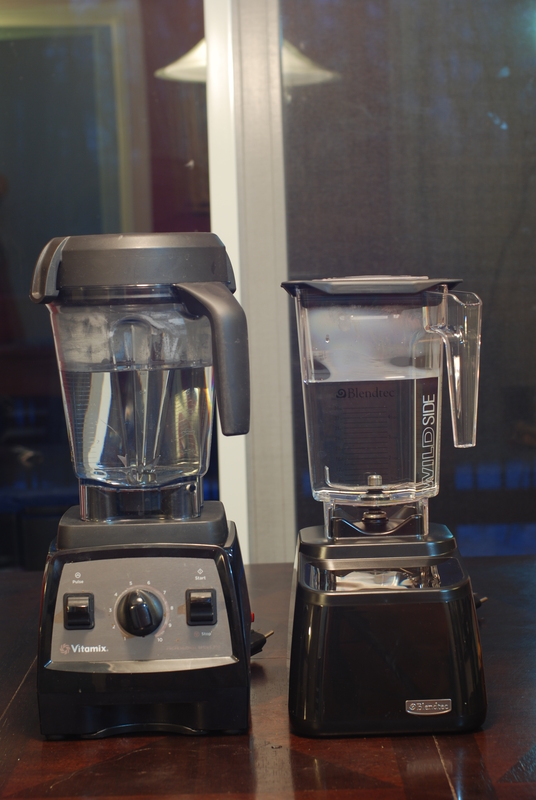 The front of the Vitamix Professional Series 300 and Blendtec Designer Series, both powered on. 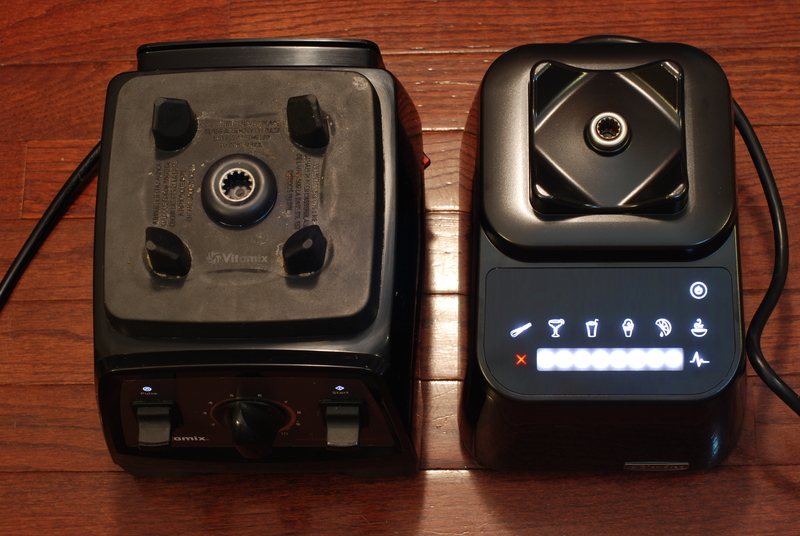 The top of the Vitamix Professional Series 300 and Blendtec Designer Series, both powered on. One benefit of the larger Vitamix base is that the power cord can be completely wound into the base of the blender or fully extended. The Blendtec has the benefit of a smaller profile, and the cord length should work for most home users, but I definitely appreciated the ability to have a lengthen or shorten the power cord with the Vitamix by winding the excess cable into a guide in the bottom of the blender body. The back of the Vitamix Professional Series 300 and Blendtec Designer Series, showing power cord lengths. 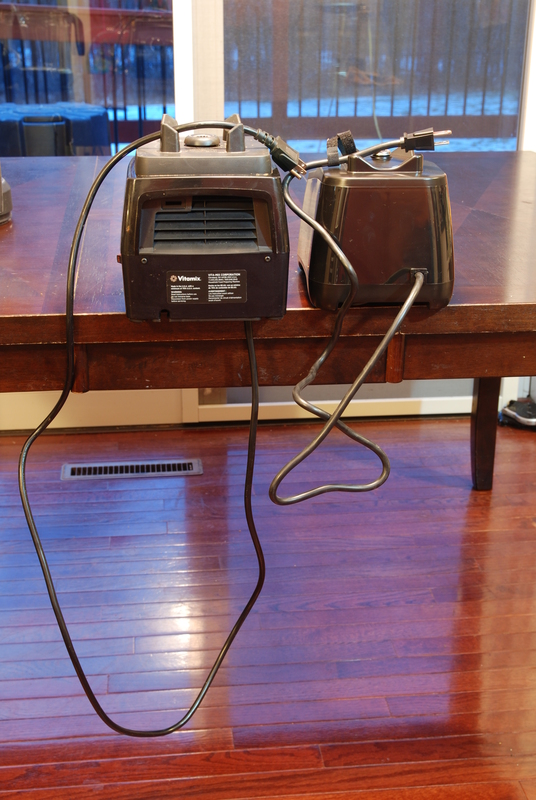 The back of the Vitamix Professional Series 300 and Blendtec Designer Series, with power cords stored/tied. One thing that surprised me is how different the blades are. 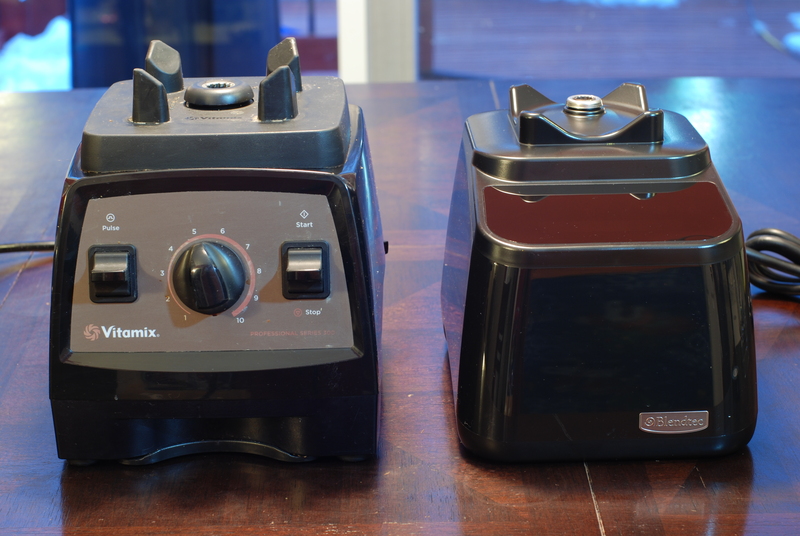 The first physical difference that jumped out when I was looking at these blenders is that the socket connecting the container to the blender body on the Vitamix is much larger than the Blendtec, but I doubt that has a major impact in how either blender performs. The blades, however, are a different story. 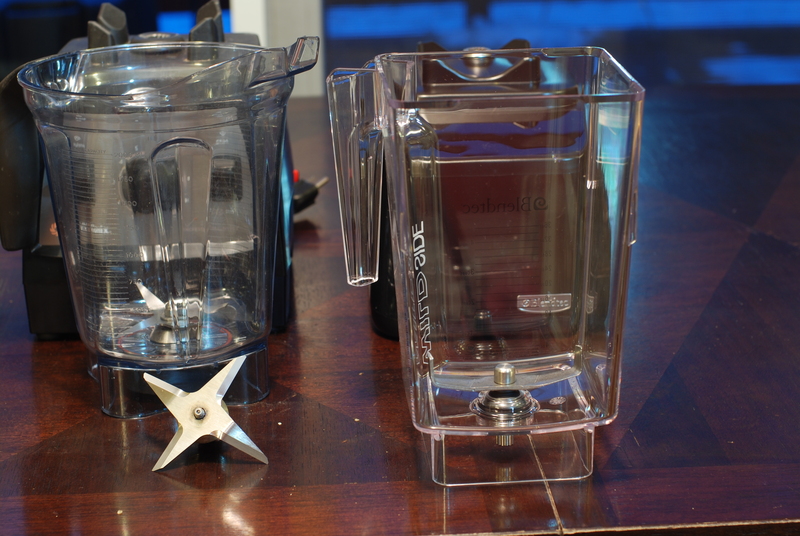 The Vitamix family of containers uses a four pronged blade that reminds me of a four-pointed shuriken with two of the four blades pointed up. And blades is the right term, as they are sharp enough to cut. 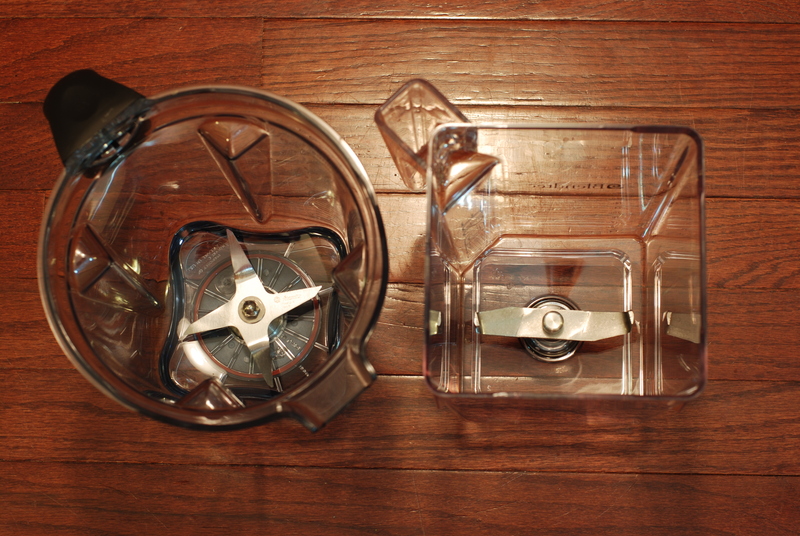 The Blendtec WildSide Jar and Twister Jar blades vary slightly from each other, the WildSide being larger, but they both have a two blade design. Don’t let the word blade fool you into assuming that they are sharp. They taper on the side of the blade that impacts food, but they are nowhere near as sharp as the Vitamix blades, which I am sure is intentional. I expect the very different blade designs to have pros and cons for each blender, but don’t yet have enough experience with the Blendtec to know what those are. 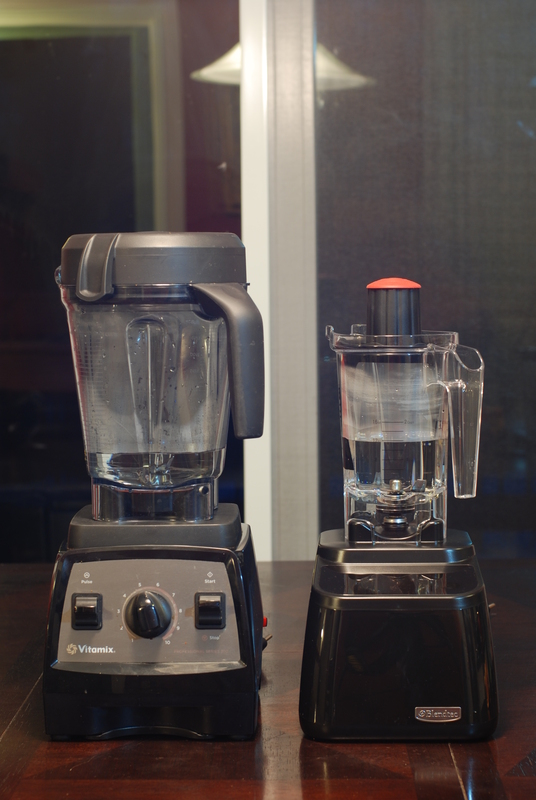 The Vitamix Professional Series 300 and Blendtec Designer Series sport very different blade designs. The Vitamix container includes measurements up to 64 oz (I’ve actually made double sized batches of hummus before, so it’s blended over 64 oz of hummus on more than one occassion). The Blendtec book states that WildSide Jar has a volume of 90 fl oz, but for whatever reason only has measurements up to 36 fl oz. The Blendtec Twister Jar has measurement lines up to 16 oz. I’m almost certain the WildSide jar would be able to handle 48 oz of almost anything (if not everything) that I’d make in the Vitamix, so I took photos with 48 oz and 12 oz of water in each to show the various sizes. 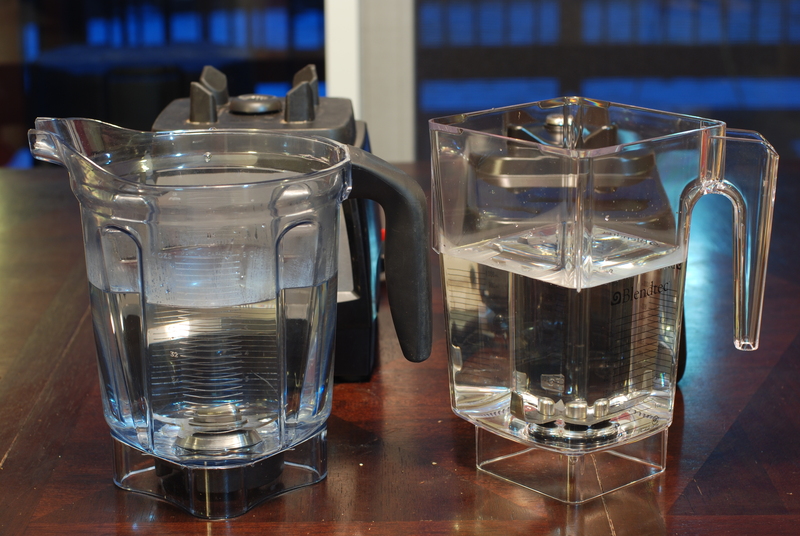 Vitamix Professional Series 300 and Blendtec Designer Series containers with 48oz of water. 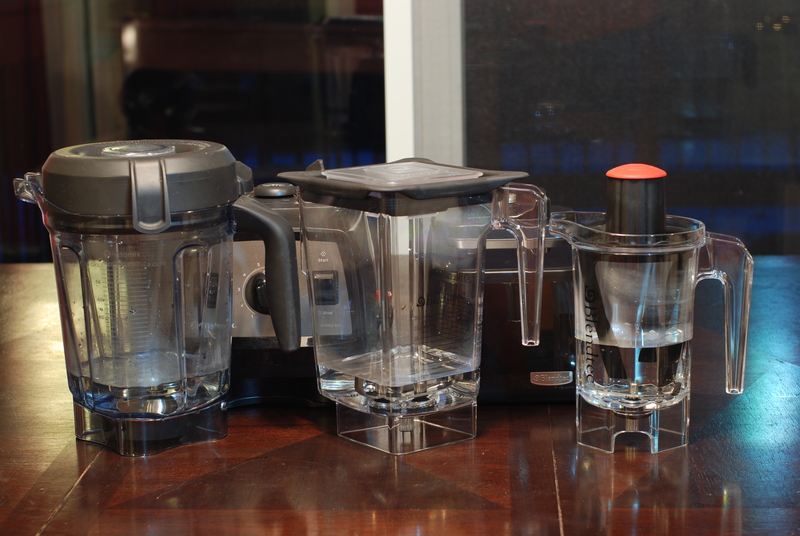 Vitamix Professional Series 300 and Blendtec Designer Series with 48oz of water. Vitamix Compact 64oz container, Blendtec WildSide Jar and Twister Jar with 12oz of water. Vitamix Professional Series 300 and Blendtec Designer Series and Twister Jar with 12oz of water. 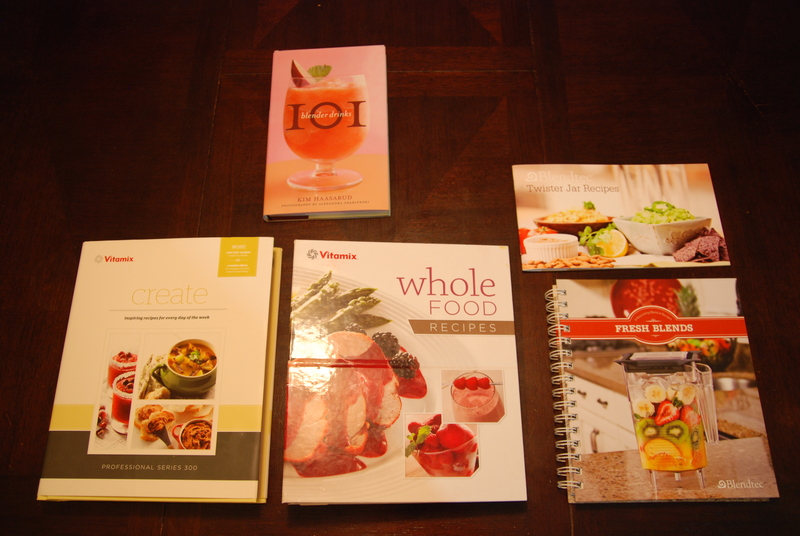 5200 because of it’s ability to turn the cover into a stand and easily reference a recipe while using the blender. The Professional Series 300 comes with a nice large hardcover book, but I’m more interested in the contents than anything else, so I’m looking forward to digging into the Fresh Blends book that comes with the Blendtec Designer Series, which apparently has more than 200 recipes. 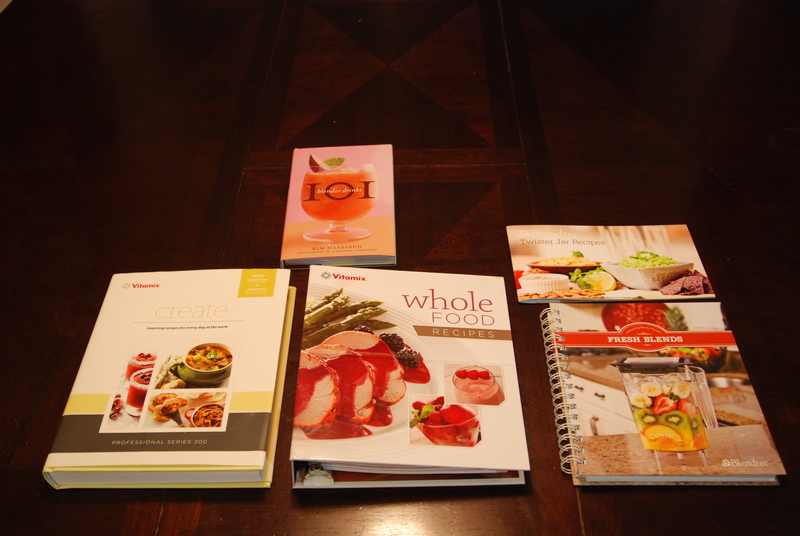 Another view of cookbooks that come with the Vitamix Professional Series 300, Vitamix 5200, Twister Jar (top) and Blendtec Designer Series (bottom). Both blenders are impressive beasts. I’ve used my Vitamix Pro 300 so much that even my second blender container (I have two) is clouded, and the blender is what I’m used to. The Blendtec is sleek and shiny, especially in these photos, as I waited until after I’d taken these photos to first use it. Any talk about which is better based on small differences in size, cord length, the inclusion of an on/off switch or a cookbook seems like it would be meaningless for most people, as the real question is: How do they each perform? I’m thrilled with my Vitamix, but as I dig though my reasons in that old post, I realize I don’t know enough to know how it compares to the Blendtec yet. In fact, I’m very hopeful that I’ll find that each blender has it’s strengths and that there will be things that the Blendtec does better. Looking at the Fresh Blends book, it seems that the Blendtec may have more of a focus on dry grains than the Vitamix. The Vitamix does have a dry grains container , but I’ve said before that I don’t do enough with dry grains to justify buying a separate container. Maybe that’s a chicken and the egg issue, and the Blendtec could send me down that road. Similarly, the Twister Jar is something I’m very much looking forward to using. I’ve said before that one of the few disadvantages that the Vitamix 7500 and Pro 300 have compared to the 5200 is that the wider container base means that they are not as well suited for very small batches. While Vitamix does offer a 32oz container , I personally didn’t think it was something I needed, so I’ve made due with the larger container. I can certainly see the Twister Jar being very good for dips, sauces, baby food and other recipes that are made in very small batches. I’d love to be able to give a definitive answer on which blender would be good for what kind of person, but I don’t know yet. Tonight we had pasta, and I wanted to turn some parmesan into parmesan powder, a great use for the Vitamix that I’ve written about before. I figured I’d try the Twister Jar, thinking that the twister lid might help me mix it more evenly. The slice of Parmigiano-Reggiano that would easily hit the blades in the Vitamix was long enough that it became stuck in the container, sideways and above the blades, and then mixed unevenly before over-mixing into hot and soft clumps. I later found a recipe in the Fresh Blends book specifically for mixing Parmesan Cheese, so I’m sure the Blendtec can create better powdered Parmesan in the hands of a more competent user than what I made today, but I clearly need learn some things from the Fresh Blends book and I probably need to learn some other things the hard way as well. If you’re in the market for a blender, it’s worth pointing out that, similar to the Vitamix refurbished options I’ve written about, Blendtec has a Recertified Blender option. Please do let me know any question or requests you might have. I’ll learn more about the pros and cons of each blender as this year goes on, and I’d love to share feedback that will helpful to others.